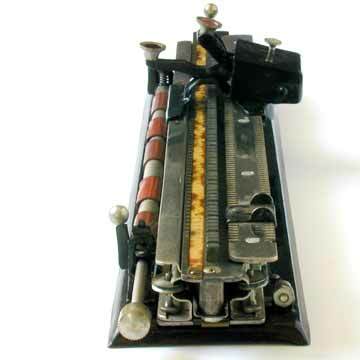 The Karli is one of the most obscure machines in typewriter history. Different authors, repeating after eachother, know literally nothing about it, except that one specimen of the machine is known to exist in the Dresden Technical University in Germany. In fact at least three other examples are known to exist. Production of the Karli 1 started in fact in 1927 in the German city of Leipzig. 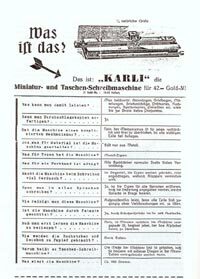 The machine was designed and produced by Karl Dietrich. A year later, a second model of the Karli appeared on the market. It is not known how many machines were produced. The serial number of the machine presented here (a Karli 1) is 1347, which seems to indicate that quite some machines were built, but it is more likely that the serial number count was started at a figure over 1,000. The Karli is a long and narrow machine. The total length of the base is 31.5 cm. Full length pictures from all sides are combined in picture 6. The other pictures show details. The type bar is placed full length (35 cms) to the left of this text.